Can I read the Bible on my phone? That is a question that excites me! You see, in our Lutheran tradition, few worshipers bring a Bible to church. I'm guessing less than 10%. I'm not entirely sure why. Maybe it's because we print the readings in our worship folder. Maybe you just never got used to doing it. But if you are asking if it's OK to have God's Word in front of you during the sermon or class, I'm all for it. Now of course, you are going to have to ward off some serious temptations. Like texting your friend to let her know you really like her dress. Or checking Facebook to learn what some of those who aren't in worship are doing with their Sunday morning. Or reading the Sunday paper. But there are also some amazing possibilities at your fingertips. Check another translation to see how words and phrases are expressed. Check the definition of a word you don't understand. Bring up a map of a place you've never heard of. Text a question to the pastor. (I'll answer as soon as I can.) Message your friend and tell them, “You should have come to church this morning. We talked about ______.” Or Shazaam one of the worship songs or hymns to download later. Take some notes. Seven years ago, we wouldn't have even asked this question. Six years ago the first iPhone was released. God has kept up with the technology quite well. 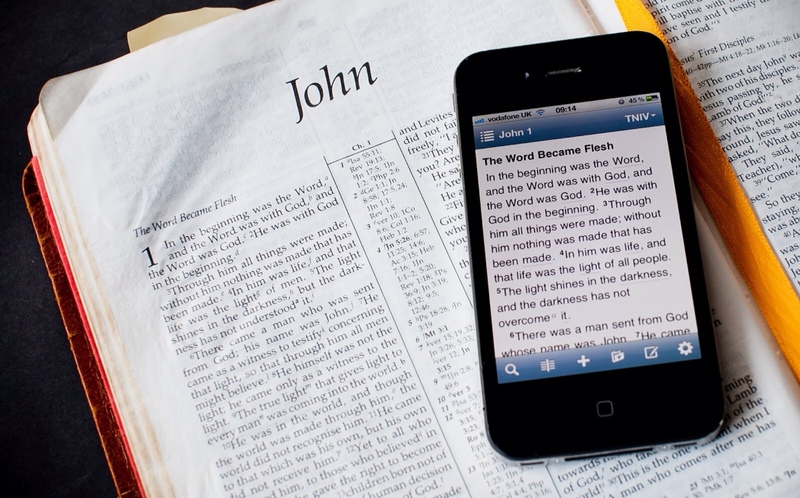 Many of my confirmation students are using their phones to access bible in class. On Thursday mornings, about half of the men in bible class use a tablet. This entry was posted in Ministry and tagged bible, ipad, iphone. Bookmark the permalink.